Bubblews Addiction - no joke! I am not joking about this and I am not using "addiction" in any light hearted way. I'm very serious. 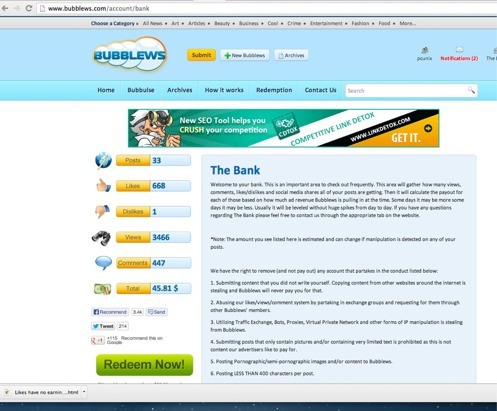 First, if you don't know what Bubblews is, I'll explain it. Bubblews is an Internet writing site with similarities to Facebook. It only requires short posts of 400 characters, which is 80 words or so. Like Facebook, it is very socially oriented, but unlike Facebook, the members are paid for their activity. 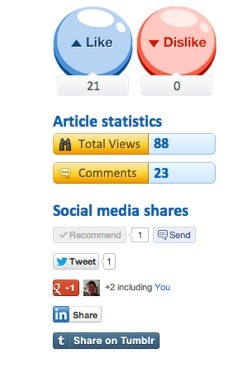 I wrote there for just short of 7 weeks, posting 238 articles. I earned a little over $200.00 in that period, which would be pretty poor pay were I not also having fun doing it. I've quit posting there temporarily, though not because it's not fun. I quit because I think the site is doomed to failure and I detest seeing my articles go down the drain with it. I therefore don't want to add any more; losing those 200 would be bad enough. Update: I decided to give them another chance. Why didn't I post them here? Because they don't fit here. They are on subjects unrelated to anything I do here. It's that simple. I'll get to why I think Bubblewswill fail soon, but first I want to mention the addiction issue. 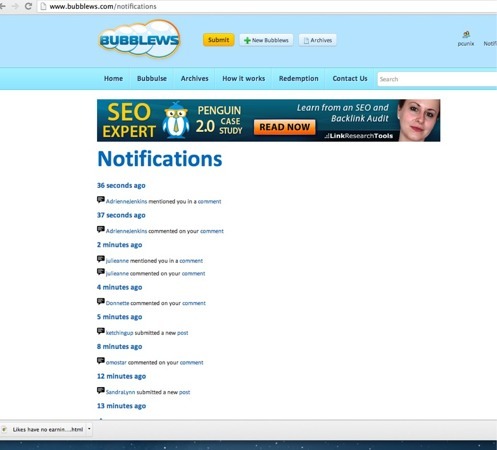 It really seems to me that Bubblews was *designed* to be addictive. As one of the principals has a background in psychology, that's certainly possible, but whether by design or accidental, Bubblews is a slot machine that keeps you playing and makes a lot of money for the casino that owns it. Did you notice "This is an important area to check out frequently"? The money builds from views, likes, dislikes and comments. On average, each action is worth about a penny. Your take builds slowly usually, but there is always the possibility that some post might catch fire and attract many thousands of views. That happened to a post I made here recently - over a few days it had over 20,000 views. Had that happened at Bubblews, I would have earned over $200 from just that post - a Jackpot! That's why Bubblers (members of Bubblews) keep watching their bank. Bubblers also get positive reinforcement from Likes, social media shares and comments. Notice the size of the Like/Dislike buttons. Those are begging to be clicked, aren't they? Pretty colors, too. The only difference between those and a slot machine is that they don't make a cool noise when people click them! One not so obvious thing here is that you only get to see the last 200 notifications. If you are active, you may receive more than that many over night. This creates urgency - did someone mention my name or Like my post? I need to get back to Bubblews to find out! The lack of detail in the notifiers also encourages activity. Rather than showing you the name of the article or comment referenced, only the word "comment" or "post" is used, encouraging you to click through to learn what it was about. Pull that slot machine lever again! The exhortation on the Bank page - check me frequently!. The 200 notifications - rush back, you might miss something! The big Like button - they Like me! The trickle of pennies - they are giving me money! I might hit a Jackpot! I can testify that even though the money was obviously not an important factor, I felt the tug of true addiction here. It was FUN to write, fun to collect Likes and views and comments, fun to get paid for them! Why do I think it is doomed? If this was designed to be addictive, the designer forgot that these addicts can cheat. How? By indiscriminate Liking. If you run through clicking that big Like button on every post and comment you can find, you are feeding pennies to other Bubblers. Some of them will do the same to you. That's (unfortunately) human nature - you feed their addiction, they return the favor. You can make a lot more money this way. Slap up a bunch of useless 400 character posts (or even a bunch of useful posts!) and rake in the cash. I tested this proposition by writing an article that explained exactly what I was doing and asking visitors NOT to like it. Of course it still got Liked! Those were the people gaming the advertisers. They didn't READ, they just clicked Like in hopes that I would do the same for them. You'd even see people writing about how to most efficiently "manage" their notifications.. in other words, how to more quickly identify the people you expect to reciprocate! If you could cheat at slot machines, the casino would either fix them so you could not or pull them out. The money for Bubblews obviously comes from the advertisers. The cheaters aren't reading ANYTHIG, they are just clicking Like. Advertisers don't like that. There is also a large amount of plagiarism at the site and neither of these problems are being addressed very well by Bubblews staff. In fact, Bubblews support actively ignores many questions relating to such cheating. That is, you will get answers to some support issues, but not to others. That's not good. I still have hope for the site. As I said, Bubblews is a tremendous amount of fun. I particularly like it because I could write on subjects that do not fit well here. If they can fix their obvious problems, I'd love to go back. -> Bubblews Addiction - no joke! This is my Tech site. Generally speaking, you won't find anything here in the same vein as what I wrote at Bubblews. There is a little sprinkled in here and there in Opinion, Misc and Lighter sections, but not much. This is mostly Tech and pretty narrowly focused tech at that. I couldn't agree more with all that you've said. Furthermore, I find the way the staff interacts with members to be horribly unprofessional. If that's any indication of the way they interact with advertisers, there's no way the site will last for long. I'm continually disgusted by the way I see employees rudely respond to questions. Also, I have a hard time believing that any site that relies on interaction between members will last long term (hello, Squidoo). The site needs to draw from outside the community to survive in my opinion, and I don't see that happening. If you are large enough (Facebook) you do not need outside. But yes, support is terribly bad there. It's NOT just slow - they flat out ignore some questions and answer others. I love the concept, but the execution is badly flawed. Sounds like a huge time-waster in the same vein as Facebook, Myspace, et al. In some sense, most everything we do is a waste of time. Bubblews is a fun place, lots of interesting people write there. I have written 320 posts bubblews and I was not paid at all. Sorry to say this but do not know how they imagine a compete with facebook? My husband was paid 3 times and after that no more payments and he waits 40 days. I expect my money for 2 months (still do not think that's going to get). Many of the unpaid turn out to be TOS violators - knowingly or unknowingly. If so, your husbands account may have been affected too: guilt by ip association. If we knew your username we could check for likely errors or seek help at the Facebook BubblersLounge group.